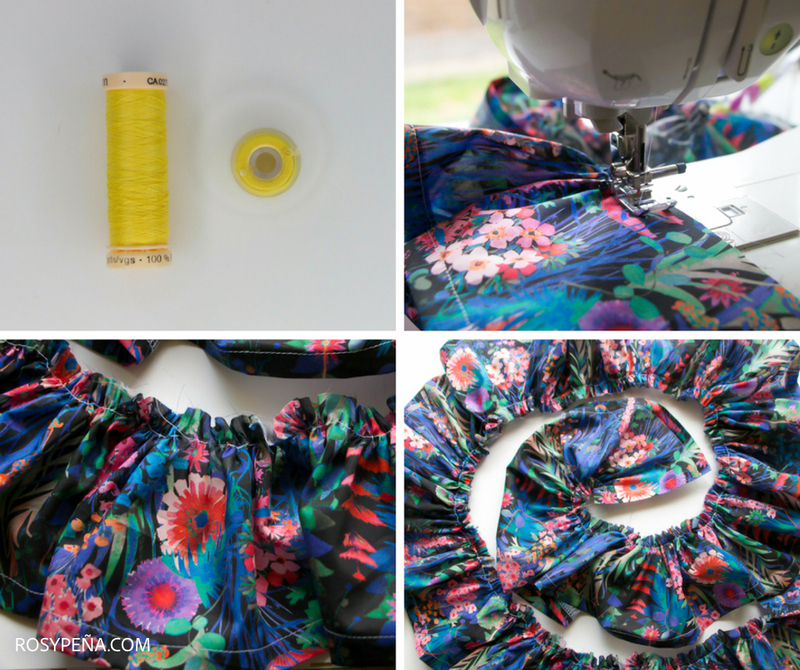 Sewing Perfect Gathers + How-to Mix your Prints! Today’s look is this two piece outfit from a gorgeous LIBERTY LAWN and STRIPED KNIT and I love every bit of it! I may have went a little picture heavy on this one! You’ll find a pattern review below along with tips on sewing gathers and an article on mixing your prints! Enjoy and have a fabulous week! XO ROSY. Pattern Description: Misses’ Off-the-Shoulder Bodysuits and Wrap Skirts with Side Tie – M7606. What did you particularly like or dislike about the pattern? I like that it has two separates that can be mixed and matched with other outfits. Fabric Used: LIBERTY PRINT, for the skirt. STRIPED KNIT for bodysuit. Pattern alterations or any design changes you made: I added almost double to the length in the ruffles, creating much more fullness than the pattern suggests. Would you sew it again? Would you recommend it to others? Yes, I do recommend. Gathers completely elevate the look of a finished garment. They add elements of flirty-ness and romance to almost any outfit. Not to mention they’re so easy to make! Yes, EASY. There’s a sewing “hack” you can use on your machine, without any special presser feet, to quickly create ruffles. In this article I’m showing you two tried and true methods that I use when making ruffles! I’ll show you an “easy” method and the traditional method. Start by preparing your strip of fabric as normal, I like to hem prior to ruffling. Set your machine to a basting stitch AND turn your tension to the highest setting. Place your fabric under your machine and sew as your normally would. You will notice your fabric automatically starts to create ruffles. It’s that easy! Prep your fabric as normal and set your machine to a basting stitch. Using your seam allowance (normally 5/8”) sew a straight line, backstitching at the beginning of your seam. When you reach the end of your seam, do not backstitch. Instead pull out extra threads (upper and lower bobbin thread) of around 10” or enough for you to hang on to. Start again at the beginning of your seam, this time sewing 1/4” away from your previous stitches. Finish with the same steps as before. Carefully pull on your two extra threads from the bottom of your fabric and ease in the fabric to create ruffles by hand. Quick Tip: I like to use a contrasting bobbin thread when using this traditional method. Threads tend to land in every direction when you’re trying to manipulate your fabric into gathers. By using the contrasting thread you’ll quickly be able to identify which threads you need to pull on. Super simple, but it makes a world of a difference! Note: This method works great because you have more control of the amount of fullness you want to add to your ruffles. This traditional way takes a little more time but also leaves you with gorgeous ruffles! Now go add some fun and flirty ruffles to your sewing projects! Guide #1: SHARE A COMMON COLOR – This guide always applies. Choose fabrics that share similar colors, or at least complementary colors on the color wheel. You can get away with pairing even the boldest of prints as long as they share complimentary threads. Takeaway: Stick to a cohesive color palette. Guide #2: CHOOSE ONE PRINT TO DOMINATE– There is nothing harsher to the eye, when it comes to print mixing, than seeing an outfit and being so distracted by all that’s going on that all you want to do is look away. Choosing one print to dominate over the rest and be the “star of the show”, makes mixing your prints a breeze. Takeaway: Choose one bold print and work around it, don’t compete with it. Guide #3: USE DIFFERENT SCALES – Playing with size is an easy and awesome tip for print mixing. Pair a small scaled dotted print with a large scaled dotted print. The opposing sizes are more appealing to the eye and interestingly enough, create a better sense of balance when it comes to print mixing. Takeaway: Mix your sizes. Guide #4: INVERT YOUR COLORS- Another great guide when rocking prints is to simply invert your colors. If you have a primarily white over navy stripe fabric, pair it with stripes that are more navy than white. Super easy, right? Takeaway: Invert your colors from top to bottom. Guide #5: LEOPARD IS A NEUTRAL – We all know how to pair our neutrals. Luckily for us, in the print mix world, leopard prints are considered neutrals. Use this guide creatively on days where you don’t want to think about it but still want to look chic and stylish. Takeaway: When in doubt, use your “neutral”! (Row 1) B&W STRIPE, LEOPARD, (Row 2) FLORAL KNIT, PURPLE DOT KNIT (Row 3) WHITE DOT KNIT. BONUS TIP! : Break things up a bit. Print mixing is awesome and so chic, but don’t be afraid to throw in some solids by using a basic layering piece like a cardigan, or accessories such as a solid belt or purse. Utilizing solid pieces in your print mixed outfits is just another way to show your sense of style and add even more flare to your chic outfit. Hi Rosy, Love your style. I’m new to sewing I love the skirt (M7606). I am going to try this pattern can I use a stretch denim or a telio ponte fabric for this pattern. Thanks. Thanks so much! I’m glad you love it! The skirt is a wrap so you don’t have to worry much about fit, a denim would work and a ponte for the bodysuit would be cute! XO. Beautiful outfit! Thanks so much for the gathering tip. Rosy, you are such an inspiration. I have two toddlers myself and am constantly juggling my career satisfaction with being the best mother possible. It is fascinating to hear other women share their personal struggles, too. You have a beautiful blog and make gorgeous fashion (I adore your fabric choices for the patterns you sew). To know that you also balance motherhood… you are killing it! Thank you for sharing! Thanks for the fab gathers tutorial, and you’ve definitely inspired me to mix those prints up!! Good for you, Rosy! It’s always great to even be open to stepping outside your norm to check out new opportunities and you did just that. Print mixing is relatively new for me but this article gave great tips I can use to step out of my own wardrobe box! LOL Thanks for sharing! Just wanted to let you know that I’m proud of you for giving LA a chance! And being true to yourself and your family! I’m glad your back! Fantastic look and instructional post. I needed this instruction on print mixing and plan to use it. It’s always hard to move away from home for a job and I commend you on taking that step. Enjoy your Life!! Hi Rosy, I was so thrilled to see your blog this morning and glad to have you back!! You took a huge step out of your comfort zone and that is so commendable on your part and a great learning experience to draw from. There’s nothing like home, family and friends that’s the core of our happiness. Rosy!! So happy to see a full tutorial! Good on you for stepping out the box and venturing out to something new – I’m sure your family is super happy to have you back! Looking forward to seeing tons of posts on your blog – as always – good luck to you back at home and we’ve missed you!!!!! Stay blessed beautiful!